Each year the City of Moreland transforms public spaces alongside and around the Upfield Bike Path and train line with work created by artists for specific spaces. And one of the best ways to discover the work is of course, by bicycle! 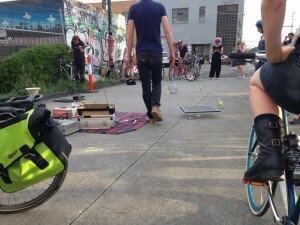 The Squeaky Wheel have worked with Moreland over several years now to deliver bicycle tours in conjunction with the Moreland Public Art Show, whether they be family-friendly versions, night rides or rides to celebrate the launch of the festival. Our first ride for 2015 in conjunction with the MoreArt festival will be the Launch Ride. Hosted by Jane O’Neill this is sure to be a great kick-off to the MoreArt season! Jane O’Neill is a freelance art curator and the founder of Art Aficionado Tours – a Melbourne-based team of dedicated contemporary art curators committed to the promotion of Australian and International contemporary art projects through art tours, public talks, collection management and written essays. This tour is appropriate for intermediate riders and will take place mainly on off road bike lanes (Upfield bike path) – some riding on on-road bike lanes required.